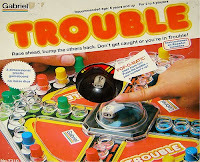 Why was Pop-o-matic Trouble so cool to me as a kid? I can only assume they shoved the dice under a little mini-version of Stephen King's "Under the Dome" because they knew kids lost dice, or put them up their nose, or ate them. But somehow, pressing on the plastic top rather than shaking the dice was MUCH cooler. Wikipedia points out that two other Milton Bradley games, Headache and Frustration, also utilized Pop-o-Matic, uh, "technology," but they never were as popular as Trouble. I don't remember Trouble being a very fun game though, do you? I mean, I guess you got to land on someone's spot and then send them back, but lots of games had a variation of that. But, it had POP-O-MATIC MAGIC!